Jim was born in Stuttgart, Germany, while his parents were each teaching at the Army Base there. They moved to Hayward, CA a couple of years later, then settled in Pleasanton. (Jim currently lives in Livermore). 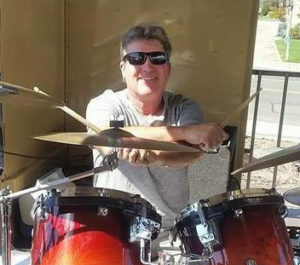 Jim started playing drums when he was about ten years old, continuing through middle school, and ending up in the Amador High School Band. Bands he’s performed in: Public Eye, Possible Motive (warmed up for Elvin Bishop), Spitfire, California, High Rise, Run for Cover, Jet Lag, Blue a Fuse, Word of Mouth, Jimmy Lions, Eric Martin. Some of Jim’s favorite bands: Led Zeppelin, Boston, Scorpions, Eagles, Phil Collins. Really just most all rock bands from the 60s to the 80s! Equipment Jim uses: Tama, and DW drums, and Zildjian and Sabian cymbals . He also collects Ludwigs drums. Life Passions: travel, classic muscle cars (he owns a ’67 Camaro and a vintage GTO), family vacation time, football, baseball, ice hockey, boating, BBQs, camping, playing Rock Music, and collecting vintage drums. Jim loves to see the dance floor packed with people when he’s playing!